Prefer to register via postal mail? Register now to attend the North Carolina Real Estate Industry's Event of the Year! Simply complete the brief form below. All participants attending any event connected with the NCAR 2014 Convention & Expo must be registered for the event and have paid the registration fee. Liabilities insurance requires every attendee be registered. 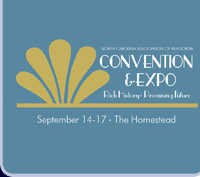 PLEASE NOTE: No convention registrations will be accepted after Monday, September 8, 2014. You may register onsite at the convention during Registration Hours. When you invite your spouse who is NOT an NCAR member, your spouse/guest will receive the special guest rate listed above. This fee will enable your spouse to attend all convention events, except those that require additional fees, such as continuing education courses and optional activities. If your spouse is an NCAR member, both of you should pay the regular registration fee. Daily registration passes must be registered via the pdf registration form to receive the daily rate of $165 per day. Please note the registered day on the form. Daily registration includes entire day's activities. Optional events are an additional fee. Registrant contact information will be supplied to exhibitors at the Expo for the limited purpose of contacting you one time after the trade show, through marketing vehicles approved by NCAR. Please feel free to contact the Events Department at 800-443-9956 or mlowe@ncrealtors.org if you have questions or need additional information about any of the above registration information. Please be advised that you will be charged the registration fees for your spouse (spouse fees are listed above). Not bringing a spouse? Skip to the payment entry page by clicking 'Next' at the bottom of this form.